The word validation has been cropping up everywhere I turn for the past two weeks and it is a piece of Dare 13. It’s something that I’ve struggled with for years. I always thought empathy and validation were essentially the same thing. I tended to be pretty good on the empathy front so I assumed that my empathy was in fact validating my kids. After all, I was listening, naming their feelings, trying to connect on an emotional level. I was telling them I understood why they felt the way they did, and then I would share how I saw the situation. Wrong. (That is the sharing how I saw the situation part). It took a good friend to call me out on it one day. Actually we were in the middle of a disagreement. It wasn’t heated and I was doing my best at showing her empathy at the time. Then I used the word. You probably use it often too. It is that little word where we invalidate everything we just said. I used the word “But”. Validation is more than empathy. Validation says that you have a right to think the way you do AND feel the way you feel. It also says that I’m willing to acknowledge it. I am willing to be present in your moment. On a surface level, validation is acknowledgement. When we are standing in the kitchen prepping a meal and our teen comes in from school, turning to acknowledge they are home, looking them in the eye, asking a question is a form of validation. It says that I think you are more important that whatever I am doing in the moment. I choose to be present and engage says a lot to validate the importance of that person in your life. Multi-tasking while our teen is sharing their story is not validation. Oh, my. How many times a day do I actually stop what I am doing to validate the importance of my teen in my life? Another level of validation is to summarize and reflect on what the other person has said and maybe include how you think the person is feeling. Just by summarizing in a non-judgmental way, it tells your teen that you hear her AND you acknowledge her world. If your teen comes in crying and tells you something her best friend did to her, “Meggie told everyone at school that I liked Tim. I hate her!”, validating her might be something like “Oh, I’m so sorry she told everyone that. You must feel so hurt that she would betray your confidence.” Another step would be to hug and console her by letting her cry on your shoulder. How many times do we invalidate our teen by saying things we think will fix the problem? “Oh, honey, you don’t hate Meggie. She’s your best friend.” or “Meggie certainly didn’t mean to tell everyone. You’re just hurt. This will blow over.” We may say the words in a soothing manner; however, have we thought about what we are really saying to our child? Words such as these defend the other person and can make our teen feel like their thoughts and feelings aren’t justified. To take it up a notch, we can even validate someone when we are in the middle of a disagreement. Listen carefully to their words and summarize them to make sure you heard correctly in a non-threatening, non-judgmental way. Read their body language and use words to describe what they might be feeling. Get consensus that the words you choose are accurate to them. Understand their tone of voice and acknowledge the emotion the other person is conveying. Agree with the other person as much as possible. In other words, agree that they have a right to feel the way they feel and they have a right to think differently than you. Apologize for your part in making the other person feel the way they feel even if you feel that you did nothing to make them feel that way. Sometimes we do and say things that are taken the wrong way, but we can still apologize for the way it came across. Try to resolve the disagreement only after the other person feels totally heard and understood. Make sure they know that you are on their team. As she shared, I imagined a ping-pong game. You did this, justification. You did that, justification. When this happened, justification. You didn’t, justification. Back and forth without any acknowledgement of his feelings. No summarizing to get clarification of his thoughts or to make sure he felt heard. “How did the conversation end?” I asked. The son most likely wanted reconciliation and an adult perspective of what happened while he was growing up. Let’s face it. As parents we will make mistakes and we want our kids to bring those things they are having difficulty understanding to our attention. Thankfully, this mom was open to the conversation; she listened and she did apologize. That’s a great first step. But validation can be so much more if we choose to not justify our actions. Justification says I’m right and you are wrong. It can become threatening and feel judgmental to the other person. Many of us do this without even realizing it! It is second nature to justify our actions and responses especially if we grew up in a home that didn’t use validation as a means of encouragement and connection. This friend and I are still talking about her conversation with her son. She didn’t even recognize that there was more she could have done. I’m encouraging her to try practicing the skill of validation and reopen the conversation with her son in the future. If she does, then full restorative healing can take place. 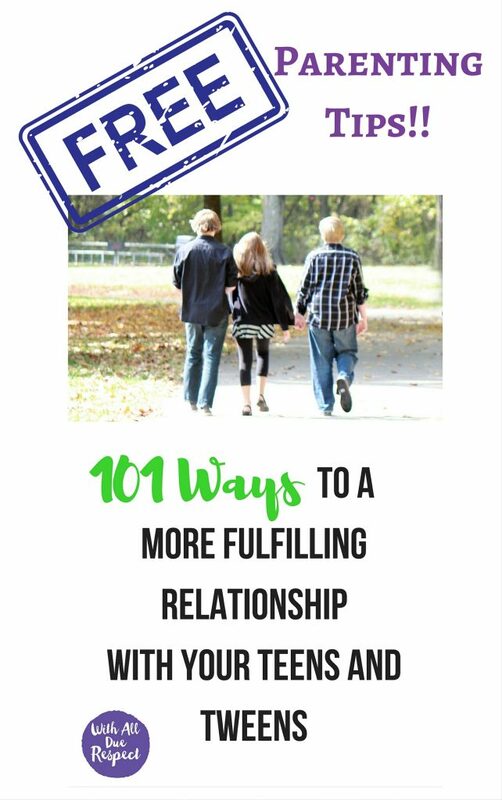 Acknowledgement of our child’s thoughts, frustrations, and emotions through validation can strengthen our relationship beyond our wildest dreams. It communicates acceptance. It communicates that their thoughts and emotions have value. And even when we don’t necessarily agree with them, it shows that there are different ways to view any situation and their way is okay. Validation leads to an opportunity to later explain your view of the situation without condemnation. They’ll be more open to listening to you because they feel valued by you. 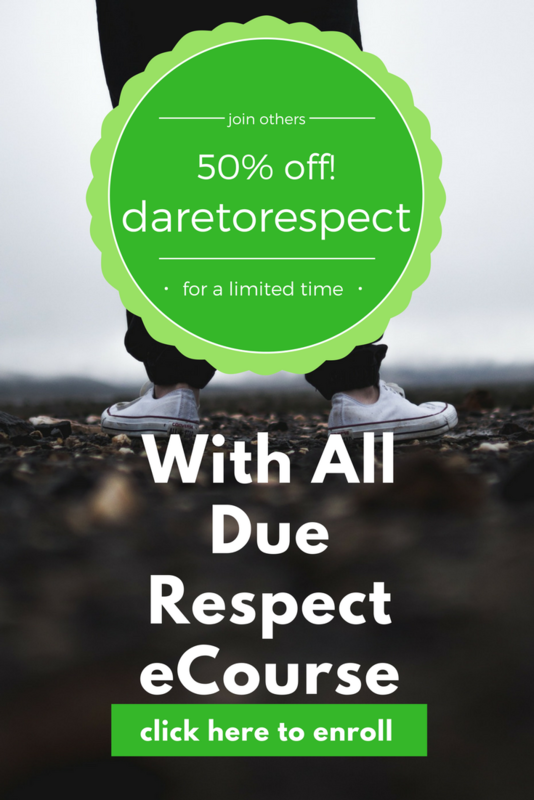 Dare you to learn the skills of validation to enhance the relationship with your teens. Start becoming more aware of your conversations with your teens by getting rid of the “but” and justifying your actions. If you do, it will strengthen your relationship. Are you thinking about Fall yet? Interested in leading a parenting Bible study that will have women sharing on a deep level from the beginning? Want them to walk away with a WOW! experience? With All Due Respect will do just that and we promise to make it easy to lead. You don’t need to be a perfect parent; you don’t need to have perfect kids; and you don’t need to have ever led a group before.